Discussion in 'Extended Range Guitars' started by NeiloMac, Sep 2, 2017. I've just taken delivery of one of these and I figured you folks here on SS.org would like to hear about it. First of all, it's a decent wee guitar for the money (sub £250). It has its foibles - the tuners could definitely be replaced with better units (they feel a bit cheap and aren't massively consistent) and the pickups are maybe a bit hotter and bassier than I would like (I might try lowering the pups and see how that affects it), and the fretboard feels a bit dry out of the box. The Thomann site lists the fretboard material as rosewood, but I hear through the grapevine it might actually be 'roseacer' (baked maple, basically) due to all the CITES shenanigans. Maybe that's why it feels different, I dunno. Might try lowering the action a touch as well, as it's maybe a bit high at the 'dusty end' of the neck. I don't venture up that end all that often anyway, so it's not really a deal breaker for me. The guitar itself is light without feeling unduly insubstantial. Neck shape feels nice in the hand. I've noticed a few wee things in the build quality that is indicative of its price point - what looks like a couple of tiny bits of wood filler in the nato stripes in the neck, a slightly different coloured bit of maple that makes up one of the headstock 'wings', but nothing egregious. Anyway, I'm happy with my purchase. This is my third baritone (along with a Yamaha RGX 420 Drop 6 and a Fender Blacktop Baritone Tele) and it sits in my collection nicely between the other two, stylistically. ah man I want one so bad. This guitar would be absolutely perfect for my band. might splurge on one next month. I have no space for it without selling a guitar first but no one is biting on my for sales. The classified section is kind of dead. Anything I found for trade required me to find it myself. any chance of a video review and sound clips @NeiloMac ? Was thinking about making up some sound clips. If I do, I'll stick a link in here. Im wanting to pick one up next month!! Owning 2 gives a better overview of quality and can tell that they do vary a bit(not much), the quality is above good for both(not excellent thou), color and finish vary a bit, the fretboard yes should be roasted maple(that is not a bad thing actually). I updated my main one with planetwaves tuners and both have deathbuckers in them(main one has a single sized dual rail 6 usd chinese pick-up in the neck) and it gives a whole new color to it. 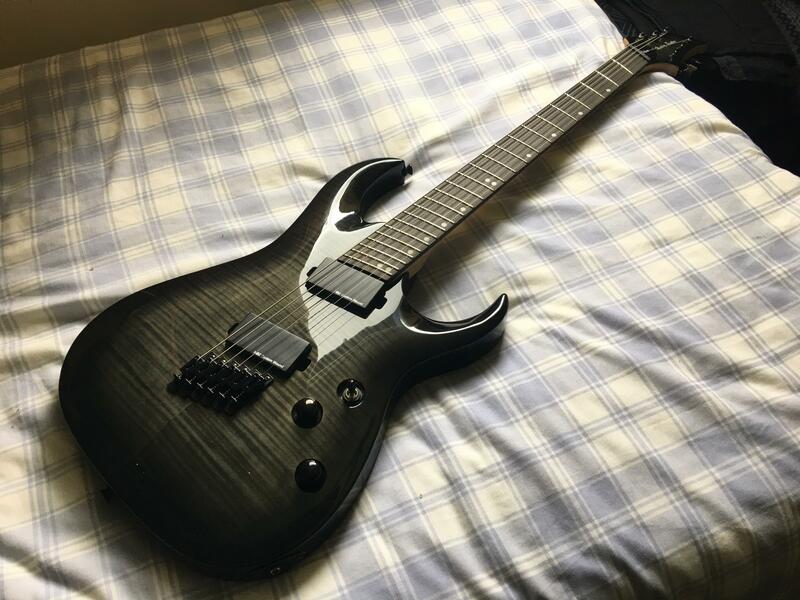 A good entry level guitar to get into 6 string fanned and baritones and can be quite sturdy as well, it can take a beating if bit upgraded. I've been gassing for a fan fret Kiesel. Have yet to try the fan! This is really good info man thanks. I want to go Active pickups in mine and Im defo going to replace the tuners. Anyone seen the 5 string Bass version they (Thomann) were selling start of the year and now not? Those were UNREAL. I want one so bad so hopefully those come back aswell. Fans are literally no big deal whatsoever. Other than first fret stuff being slightly more difficult, everything else is barely different. For me, I picked it up and played normally right away. There was literally no learning curve. Of course everyone is different but this is my experience. The big changes that you do notice of course is better tension on every string across the neck for its specific job. I.e better solos/bends and better lows/tensions. Of course the baritone scale makes the low strings allowed to be thinner which is nice. I love them. They are my new favourite thing. Thanks dude!. I will check this out right now and let you know. What did you use to record? Pod HD500 into a Presonus Firestudio Mobile, recorded in Reason 9.5.
we need some more pics of this bad boy!!! I know the weather in the north can be dodgy!, but how does the finish look in natural sun light? Thomanns website makes it look like there is a tint of blue or something to the finish which seems completely wrong based on pics of it. Just saw this, grabbed my RX100 and jumped out the back garden with the Harley Djenton and grabbed a few pics. These are all straight out of the camera - no editing, default JPEGs. (Normally I'd edit the RAWs and make them all look nice and punchy, but I thought I'd 'keep it real') In some lights it almost has a veeeery slight almost green tinge to it, or maybe that's just my wonky eyes. It's definitely a lot more silverbursty than my trans black Chapman ML1. I received my guitar this wednesday and first impressions are good. Fretwork is decent and I'm actually surprised that the pickups sound pretty good. Was planning to upgrade those to an EMG 81 but for now I'll keep them. Only thing that bothers me is the tuners.. gonna check if Gotoh magnum lock tuners sg381 fit in the hole. Nut is pretty solid too. Well worth as a project guitar! oooh these pictures look brilliant. I really like that colour on the finish. It looks better than the odd blue tint version that Thomann used for the guitar. This colour is more monochrome type colour which looks lovely. +1 on new tuners!. Its paramount on these guitars and really any project guitar tbh. Great to know its a brilliant platform for modding. I want to get the brushed chrome 57/66 set for this when I pick one up. The guitar looks absolutely sensational for the price!. Im planning Brushed Chrome 57/66 in mine.